Russian Marina Romanko won B-tournament of Moscow Open festival. There were five leaders before the last round; Marina in the last and decisive round beat Maria Fominykh, while her rivals made draws. 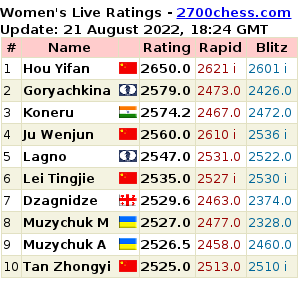 Two world champions play against each other in the first round of the round-robin women tournament of the "E" festival "Moscow Open". The leader of Aeroflot Open Anton Korobov thinks "Fools get lucky"
The Ukrainian GM Pavel Eljanov couldn't win over Russian Dmitry Andreikin in the last round of Aeroflot Open which was held in Hotel Cosmos, Moscow. In the case of victory Eljanov would take clear first place. The Polish GM Mateusz Bartel and Ukrainian Pavel Eljanov won their games against Indian players Sasikiran and Gupta respectively in Round 6 of Aeroflot Open. 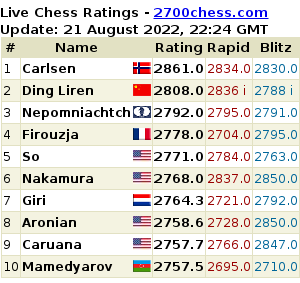 Now they, just like Fabiano Caruana, chase the leader Anton Korobov, who wins them only half a point. Nino Batsiashvili's victory over Dina Drozdova decided the prize-winners of the Student Grandmaster Cup among women. The Georgian player took the clear first place with 7 points. Giri's fourth loss in a row happened in Round 11 of Wijk aan Zee tournament. This time he was defeated by Caruana. Italian played confidently sacrificed in the middlegame and developed decisive initiative. As GM Tomashevsky, the commentator on the air of the Chess-News radio, noted Italian's achievement is worth of being awarded the prize for the best game of the day. The fifth round of Gibraltar tournament is over. The Georgian player Dzagnidze Nana not only got into the group of leaders but continued her winning streak. Yesterday she beat Brazilian GM Fier Alexandr, today even more famous Movsesian Sergei couldn't stop her. One of the leaders of Armenia national team confused in complications and was defeated by Nana. The 3rd round of A-tournament of Aeroflot Open was marked by only three decisive games. Top rated Tomashevsky drew against Mateusz Bartel. As a result of their joint analysis it turned out that a great part of their fight stayed off-screen, including the part where Black could sacrifice queen.